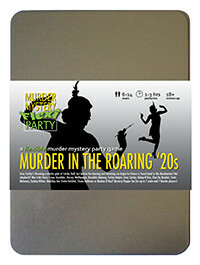 You've been invited to play the role of ART DECO in Murder in the Roaring '20s. Gray Catsby has invited his most talented and wealthy friends to a charity gala event at his countryside residence, Catsby Hall. But before any dancing and donations begin, Catsby’s fiancée, Ginger Whiskers, is found dead in the dumbwaiter! Join the flappers and dappers to find out who finished her off! Appearances are everything, so you always wear a smart three-piece suit accompanied by a bowler derby hat, with a pencil behind your ear and a tape measure tucked somewhere. Think angular. As a boy, your first drawings were of houses, but instead of stick people and bright yellow suns, you drew actual blueprints! You love architecture and art, and as Catsby has always surrounded himself with the finest things, you’ve always surrounded yourself with Catsby. You’ve been friends since you met at boarding school. You’ve yet to marry and have never been seen with a woman on your arm, leading people to believe that perhaps architecture is your only love? Arthur Deco, pleased to meet you all. You can call me Art. It’s such a shame, the beautiful curves, the ample frontage, the welcoming entrance. But I suppose I’ll be able to look at the building again when I leave. We architects love Catsby Hall. Such a shame about Ginger though, how awful! I can only imagine how Gray is feeling. I’m busy designing an archway at the moment but I can come over next week to offer assistance if needed?